Years ago (remember that I will be 73 in a couple of weeks and EVERYTHING! is “years ago”!) when crepes were all the rage, we had a crepe dish in a French restaurant in Georgetown. 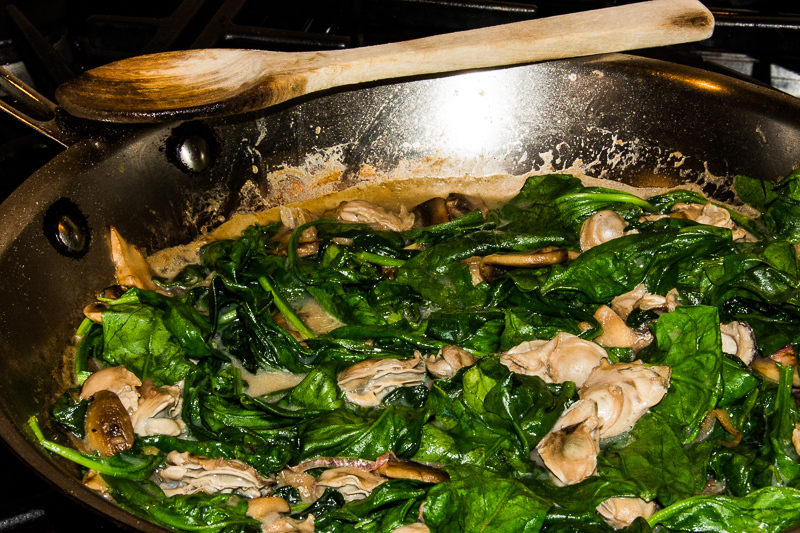 The filling was a combination of oysters, mushrooms, and wilted spinach in a light wine sauce. Of course, we came home and made similar crepes until we got tired of them, and then forgot about it. Several years ago I resurrected the idea, but instead of putting the mixture in a crepe I simply put it into small cazuelas I have – bought when Williams-Sonoma was obsessing on everything Spanish. The dish is quick, interesting, and satisfying if in a crepe or simply served with crusty French bread. In a heavy 12-inch skillet, heat the olive to fragrant and add the shallots and mushrooms. Stirring, cook for about 4-5 minutes, medium-low to medium heat, until the vegetables have rendered some liquid. Add the flour and stir to make a paste, not a roux. Cook for 3 minutes or so. Meanwhile, check the oysters for shells. Add the oysters, tarragon, and wine or vermouth to the pan, stirring, and cook until the oysters curl at the edges. Add the chopped spinach, 1 cup at a time and cook until the spinach is wilted.